Expedia has some fantastic Kamari travel packages Combining your bookings is one of the best ways to save time and money — and get your trip off on the right foot. Our comprehensive database features more than 400 partner airlines and 321,000 worldwide properties. With such a great range to select from, you can't go wrong! Don't worry about altering your group's vacation plans, as we don't charge additional cancellation fees for almost all of our bookings. We've got all the sightseeing info you need for your upcoming trip to Kamari. Grab your travel planner and get ready to start padding out your itinerary. You just can't go on vacation without discovering the most popular local sights! Red Beach and the Archaeological Museum are some places you'll want to cross off your list. Look around the incredible assortment of archaeological artifacts on show at Museum of Prehistoric Thira. It's guaranteed to be a fun and educational day out for the entire family! Travelers are spoilt for choice in and around this destination. Frequented for public worship and spiritual meditation, Catholic Cathedral is a notable theological landmark. That being said, you don't have to be a devout church-goer to appreciate this calming space. Still got time to spare? There is something bewitching about the heaving swell at the seaside. Unroll a picnic blanket, sit back, relax and enjoy watching the ocean's ever-changing moods at White Beach. With 499 properties in Kamari, hunting for a place to stay won't be difficult. But why wait around? Book early via Expedia and kick-start your next cheap vacation or luxury getaway. Relax and enjoy the facilities at The Vasilicos (Agios Nicolaos) or the Grace Santorini (Imerovigli), a couple of the more indulgent properties that the island offers. 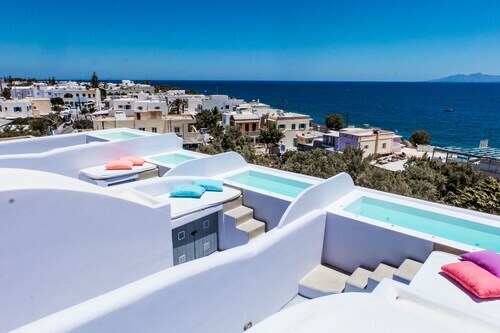 Alternatively, if you'd prefer to save your money for other activities, the Villa Renos (Fira) and the Absolute Bliss (Imerovigli) are two good options that won't break the bank. Santorini National Airport (JTR) is situated 1 mile (2 km) northwest of the center of Kamari. Collect your suitcase, wave down a cab and let your well-deserved getaway begin! 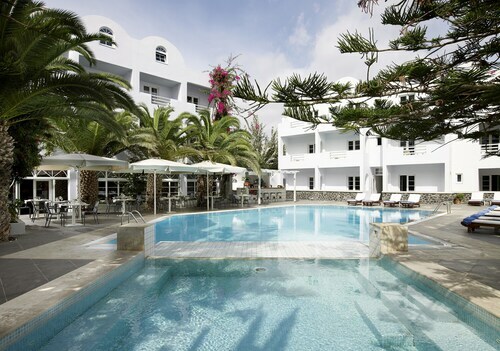 Situated near the beach, this luxury hotel is within 1 mi (2 km) of Wine Museum and Kamari Beach. Ancient Thira is 2.9 mi (4.6 km) away. 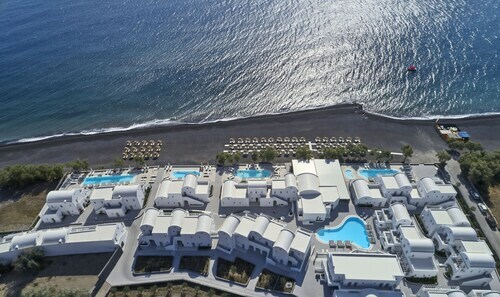 Nestled on the beach, this Santorini hotel is within 1 mi (2 km) of Wine Museum and Kamari Beach. Estate Argyros Santorini and Art Space Santorini are also within 2 mi (3 km). 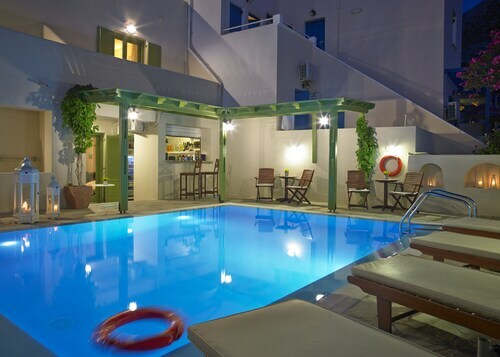 This family-friendly Santorini hotel is located near the airport, within 1 mi (2 km) of Wine Museum and Kamari Beach. Ancient Thira and Perissa Beach are also within 3 mi (5 km). 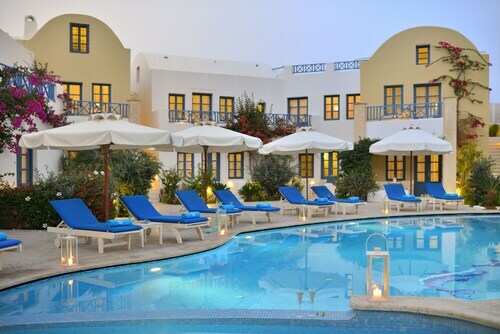 Situated in Santorini, this hotel is within 1 mi (2 km) of Wine Museum and Kamari Beach. Estate Argyros Santorini and Art Space Santorini are also within 3 mi (5 km). 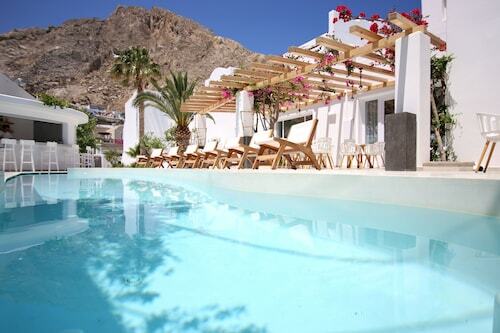 Situated in Santorini, this luxury hotel is within 1 mi (2 km) of Wine Museum and Kamari Beach. Ancient Thira and Perissa Beach are also within 3 mi (5 km). Offering direct access to the beach, this Santorini apartment building is within 1 mi (2 km) of Wine Museum and Kamari Beach. Ancient Thira and Perissa Beach are also within 3 mi (5 km). This family-friendly Santorini hotel is located on the boardwalk, within 1 mi (2 km) of Wine Museum and Kamari Beach. Ancient Thira and Perissa Beach are also within 3 mi (5 km). Situated near the beach, this hotel is within 1 mi (2 km) of Wine Museum and Kamari Beach. Ancient Thira and Perissa Beach are also within 3 mi (5 km). Sun., 25 Aug. - Sun., 25 Aug.